Iranian twins Laleh and Ladan Bijani, joined at the head for 29 years, died within 90 minutes of each other Tuesday after doctors separated them but were unable to control their bleeding in the unprecedented surgery. In their homeland, people cried out in shock or wept as state television broke into normal programming to announce their deaths during the third day of surgery in Singapore. "Is my beloved Ladan really not with us anymore?" Zari Bijani, an elder sister of the twins, said after Ladan's death was reported. Seconds later, she fainted. Hospital officials said Ladan died 90 minutes ahead of her sister Lelah, with both deaths because of blood loss. They died while still under anesthesia. "Everyone upstairs is crying," said the nurse, speaking on condition of anonymity. "We treated them like family because they had been here for seven months." It was the first time surgeons tried to separate adult craniopagus twins — siblings born joined at the head. The surgery has been performed successfully since 1952 on infants, whose brains can more easily recover. The risky, marathon separation procedure began about 10 p.m. EDT Saturday. Before the operation, doctors warned that the surgery could kill one or both of the twins, or leave them brain-dead. "When we undertook this challenge, we knew the risks were great. But we were hopeful. Ladan and Lelah knew the risks too," said Dr. Loo Choon Yong, chairman of Raffles Hospital. "As doctors there is only so much we can do as the rest we have to leave it to the Almighty." The skull bone where the twins were joined was thicker than first thought and the blood vessels linking the women more intertwined. Though Ladan and Laleh's brains were separate, they had adhered to each other after years of growing and sharing the same skull. That forced doctors to meticulously cut the organs apart, "millimeter by millimeter," said Raffles hospital spokesman Dr. Prem Kumar. "As the separation was coming to a close, a lot of blood was lost. The twins were subsequently in a critical state," said Kumar. At one of the final points of the separation procedure, surgeons cut a finger-thick shared vein from Ladan — leaving her to rely on a similar sized vein taken from her right thigh that was grafted to her brain. Rerouting the shared vein, which drained blood from their brains, was considered one of the biggest obstacles in the surgery. German doctors told the twins in 1996 that shared vein made surgery too dangerous. "I am very sad, as all of us are," lead neurosurgeon Dr. Keith Goh said. "Over the last six months, everyone who came in contact with them was touched by their personalities and the kind of people they were." For more than 50 hours, the team of 28 doctors and about 100 medical assistants worked in tight spaces in front of and behind the twins, who were in a sitting position in a custom-built brace connected to IVs and monitors. Classical music played softly, and surgeons whose expertise was not needed at the moment would slip out of the room for rest. In the final hours, the surgeons had to contend with unstable pressure levels inside the twins' brains just before they worked to uncouple the sisters' brains and cut through the last bit of skull joining them, Kumar said. The sisters' brains had "to be teased apart very slowly," Kumar said. "Cut. Teased apart. Cut. Teased apart. In the process, you encounter a lot of blood vessels and other tissues." Although the sisters knew the operation could kill one or both of them, they decided to face those dangers after a lifetime of living conjoined and compromising on everything from when to wake up to what career to pursue. 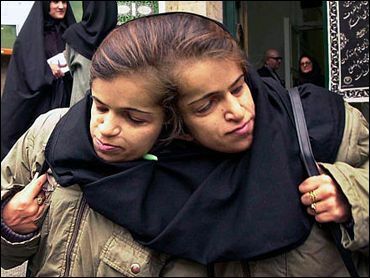 The courage of the twins won them a place in the hearts of Iranians. Television devoted many programs to the twins. Newspapers published page after page about their life and the protracted operation. Parents of the twins, Dadollah Bijani and Maryam Safari, thanked the Iranian nation for praying for their children, the state-run Tehran radio reported. "It's a national tragedy," said Ahmad Mahmoudi, a photographer in Tehran. Housewife Noushin Nowrouzi promptly parked her car after she heard the news on the radio so she could cry in peace. The Iranian government said Monday it would pay the nearly $300,000 cost of the operation and care for the twins.